This 32-ounce water pitcher from Update International can be used to serve more than just water. 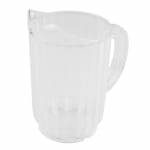 This watcher pitcher's high-quality SAN plastic construction provides a clear view of beverage contents such as soda, tea, and juices. The raised lip pour spout reduces leaks, messes, and spills and allows for faster pouring, by gathering the water at a smaller drain point. The ribbed construction of this water pitcher makes it easy to grip, while also making it resistant to dents, scratches, and discoloration. It is also resistant to breakage and cracking and dishwasher safe. Add this clear beverage pitcher to your beverage station today. "Used at a church event"